MileIQ Reviews - Good App to Track Your Miles? MileIQ is a popular app that freelancers and self-employed workers use to keep track of the miles they travel during work-related trips, miles that they can then deduct when they're filing their taxes. 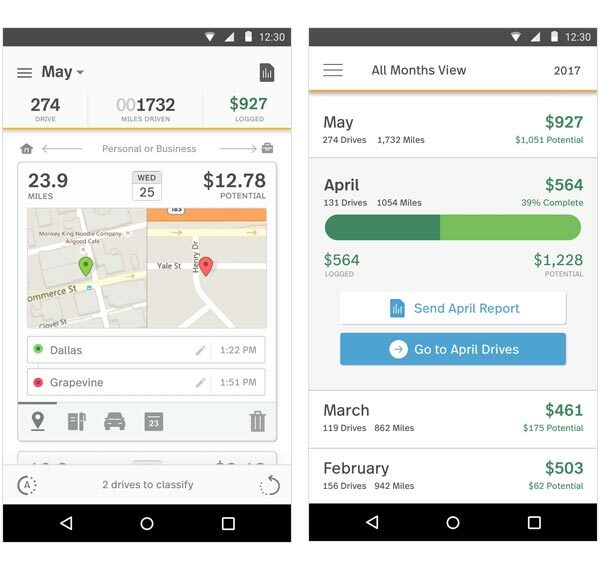 MileIQ is an app that tracks the miles you drive for work and, at the end of the year, provides an IRS-compliant summary you can use to deduct on your tax returns the miles you logged as a result of your job. In a 2016 article by U.S. News & World Report, MileIQ CEO Chuck Dietrich said that the average MileIQ user is able to deduct $6,500 from their taxes or from submitting those miles to their employer for reimbursements. If you’re in a 15% tax bracket, a $6,500 deduction can save you $975 in tax payments when you file your tax return. With so much money floating around for employees who drive, it seems like you’d be crazy not to sign up for a service like MileIQ. What are the app’s strengths? What are its weaknesses? Do you have to pay anything to use the app? Those are the types of questions we’ve asked as we researched MileIQ to find out if it’s a good fit for consumers who do a lot of driving for work. The answers to those questions can be found in this review. In the following few minutes, we’ll talk to you about how MileIQ works, what it costs and what other people are saying about it. Once you download the app on your phone and set up your account, MileIQ automatically starts logging the trips that you take in your car. So, whether you drive 30 miles for a sales car or to go to a concert, MileIQ logs it. Now, driving for work is different than driving to a concert, right? The app allows you to categorize your trips according to the purpose of the trip and if the trip was business or personal. So, you can mark the concert as a personal trip and the app won’t include those miles in the end-of-the-year calculations. The app includes the ability to name certain routes you take so it’s easier to classify them. How big of a help is an app like this? For two years I was a reporter at a newspaper that paid a certain amount of money for every mile we drove. In order to get paid for these miles, we had to write out our trips on a printed-out spreadsheet. Sometimes I forgot to bring the spreadsheet with me, so I had to scribble down mileage numbers in my notepad and then remember to enter them when I returned to the office. I never lost out on mileage but it was kind of annoying to have to carry a spreadsheet around with me to make sure I got the numbers exactly right. This is where an app like MileIQ becomes super-helpful. You don’t even have to think about logging miles because the app is on in the background tracking every trip you take. At the end of the year, MileIQ generates an IRS-compliant form that details the miles you drove for work and the resulting deductions you’re eligible for. There are a few things to keep in mind, though. Most people itemize their deductions when what they get to deduct with their own list is more than what you’d get to deduct with the government’s standard deduction. Second, if you’re itemizing your deductions, the only way you can get the mileage deduction is if what you’re going to deduct is at least 2% of your adjusted gross income, or AGI. To figure that out, multiply the number of miles you drive each year for work by $0.575, which is the per-mile deduction amount. If your AGI is $40,000, for example, then you need to be able to deduct at least $800 in mileage. Pro tip: You can’t get a tax deduction for miles driven if you get reimbursed by your employer. If you’ve got an Android phone, there’s a chance you’ll have to change the battery optimization, data saver and/or app standby settings to make sure that MileIQ is running in the background at all times. According to a MileIQ blog post about the issue, "some Android devices may have default settings enabled that terminate background apps from running after a certain amount of time in an attempt to conserve battery and improve overall performance." To remedy this, the blog post includes a list of instructions on how to optimize Samsung, LG, Motorola, Google, HTC and Huawei phones. You won’t have to pay anything to download the MileIQ app. However, once you start using your app, you’ll have a choice of free or paid subscriptions. The Basic subscription is free and will track your first 40 trips without charge. Remember, all trips count toward your 40-trip limit, not just trips you drive for business. Also, keep in mind that a trip is one leg of a drive. So, if you have to make a few sales calls and you go to three different locations, you’ll have three separate trips. If you think that you’ll need to use more than 40 trips, then you’ll have to upgrade to Premium. MileIQ’s Premium plan is $5.99 a month or you can pay a one-time yearly sum of $59.99 that averages out to about $4.99 a month. MileIQ is one of several popular mileage apps used by the self-employed and freelance community. Some of the main competitors are Everlance, SherpaShare and TripLog. The following chart will show you how a comparison of the number of rides you can get with a free version, the cost of a monthly/yearly subscription, manual tracking capability and the app’s reviews in the iOS and Android stores. Compared to the other three apps in the table, MileIQ provides the most free trips per month for those who want still want complete IRS-compliant documents. TripLog’s free version gives you unlimited trips, it provides limited IRS reporting and doesn’t use automatic tracking like MileIQ does. MileIQ’s free version has a weakness, though; you can’t manually track trips like you can with Everlance, so your personal trips will count toward the 40-journey total. As for pricing, MileIQ is the same as SherpaShare. We noticed that MileIQ and Everlance are missing the ability to add other business deductions to your reports, something that TripLog offers. This helps because it incorporates all the expenses of a business trip into your app instead of just the miles. Everlance, MileIQ and Sherpashare give you the ability to upload all your business receipts to keep track of what and where you spent your money during work trips. At the time of publishing, the app received excellent marks from more than 40,000 reviews written in the Google Play store and more than 3,400 iOS reviews. Based on the number of reviews the app has, we’d say that it’s a far more popular app for Android users. Common phrases used among those Android reviews were "easy to use" and "helpful". Of the 40,000 reviews the app received, more than 29,000 were five stars and nearly 7,000 were four stars; 4- and 5-star reviews accounted for more than 87% of the app’s total reviews. Some recent reviews of MileIQ showed some split opinions about the app: four reviewers gave the app two or three stars while seven gave it four or five. The reviews with the lower star-ratings complained about a few different issues. One woman said the app didn’t work well when she was overseas and driving for business. Another reviewer said the app gets annoying when your phone loses its GPS signal and trip logs are messed up because of it. Finally, several people complained that the app doesn’t have a manual start/stop button that can allow you to control when the app tracks your trips. Keeping track of miles has always been a thorn in the side of freelancers and even employees who get mileage reimbursements from their employer. MileIQ isn’t the only miles tracker on the market but it is, arguably, the most popular one, and for good reason. The user experience is simple and straightforward. The app gets sterling reviews from users on both the Google Play and iTunes stores, with many people commenting on how easy that app is to use. As far as downsides go, there aren’t many. Some users may be turned off by the fact that you have to pay either a monthly or yearly fee to use MileIQ. Based on our calculations, you’d have to drive at least 70 miles a month to make the app worth it. Considering that 70 miles a month equals out to about 17.5 miles a week, we think there’s a good chance you can hit that mark. Mileage deductions are just part of a wide landscape of tax considerations that freelancers and self-employed individuals need to review as they file their taxes. If you want to learn more about tax tips that can help you come April, take a few minutes to read through our top 12 tax tips for freelancers. Even though we have tons of experience with this ourselves, we felt it was best to reach out to CPAs and tax professionals to get the very best advice. As a result, our article is packed with expert insight into how you can make tax season work for you, not against you. Write a Review for MileIQ!